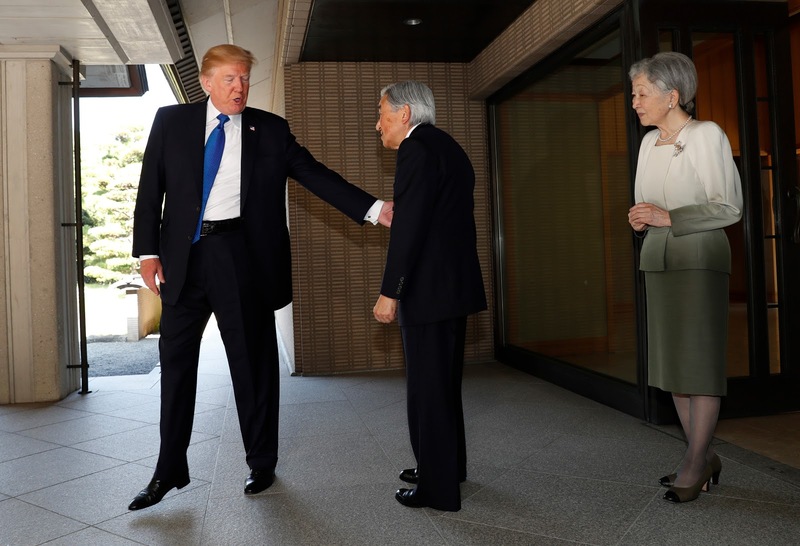 President Trump’s stop in Japan during his diplomatic tour through Asia has left many Americans concerned about his ability to function as a respectful representative of the United States in a country noted for its strict culture of politeness and formality. But, all things considered and I say this as a Japanese American who lived in Japan for a time it could’ve gone much, much worse. Don’t get me wrong: Trump was Trump in every possible way. His comments about “samurai warriors,” for instance, fall far short of communicating respect for Japanese history. Japan is not and never was a country of “samurai warriors”; it’s the country where samurai lived during a specific period of time. And, taken in context, Trump is using the phrase “samurai warriors” as a pejorative. When the president criticizes Japan’s decision not to shoot down North Korean missiles, the underlying sentiment is that modern Japan is weak, something he seemed to confirm when he informed Japanese Prime Minister Shinzo Abe that, if Japan tries hard, it can have the world’s second-best economy to the United States. So much for diplomacy. But other reports of Trump’s behavior in Japan have been blown out of proportion by the viral nature of stories like “koi-gate” and his now-infamous burger lunch with Abe. It’s not much of a stretch to imagine Trump doing something completely off-color (like unceremoniously hurling a box of fish food into a koi pond or demanding a burger instead of traditional Japanese cuisine), but for the most part, these supposed gaffes were, if anything, mere clumsiness. And it’s easy for anybody to trip up in Japan. For instance, when I lived in Tokyo, I felt like I had this secret cheat sheet as a Japanese American. At first glance, nobody could tell I was not Japanese. And as long as I spoke mindfully from the bank of Japanese phrases I constantly edited and reedited in my head, I could “pass” in my day-to-day interactions. I never would have considered myself to be the bold, brash American storming through Japan armed with my trusty gaijin-smash — a phrase used by many foreigners in Japan to describe willfully ignoring Japanese customs. Yet, I was chastened one day while accompanying a group of students on a field trip to Shake Shack (yes, that Shake Shack) when one of the students abashedly shushed me on account of my loudness. I’ve also bungled my way through a staff dinner where I allowed the vice principal of my school to serve me food even though, as his subordinate, I was supposed to be the one serving. And I was instructed none-too-gently and multiple times by a street vendor to not eat my food while walking. Although, in my defense, I hadn’t even intended to do so before the scolding began. Flash back to koi-gate where, Trump watched Abe dispense a few spoonfuls of fish food into the Akasaka Palace’s pond before emptying his entire box of food. Shortly after, Trump, grinning broadly, and perhaps with a little less grace, did the same. President Donald Trump, 2nd from right, sits at a dinner with Japanese Prime Minister Shinzo Abe at Mar-a-Lago in Palm Beach. It wasn’t effortless, maybe, but it wasn’t the episode Jezebel first described as “big dumb baby when he dumped load of fish food on Japanese koi pond.” Then he asked for the burger instead of accepting traditional Japanese cuisine during lunch at Kasumigaseki Country Club, Trump has been accused of attempting to “shun” Japanese food in an apparent show of disrespect. But it’s more complicated than that. Abe arranged the lunch, and took Trump’s preferences into consideration, choosing meals that would appeal his taste. (Of course, Abe chose with good reason: Critics of Trump’s last trip to Japan in 1990 claim that he refused to eat raw fish.) Still, as weird as the visual was, rejecting the special burger would have been more disrespectful even if it were in an effort to experience a more authentic Japan. If a Japanese host goes out of their way to serve you a meal suited to your palette, no matter how odd it may strike you, you just can’t turn it down. You must eat the burger. Trump may have put Abe in a weird position with his prior vocal hatred of sushi, but he did the right thing, considering the circumstances. In the end, it’s not like he didn’t get a taste of Japan: Abe’s choice also serves to reflect the changing gustatory landscape of Japan, which borrows from many cultures to create fusion cuisine not unlike that of America. A burger in Japan, for better or worse, does not taste the same as a burger in the United States. Speaking of sushi, I remember a time when my American co-workers and I traveled many train stops out of our way in the rain to eat at a highly recommended burger restaurant. After striking out with at so many eateries before, we were fascinated by the way the cook artfully stacked each burger to order as a master sushi chef might behind a similar counter. Not to mention the fact that we complain in America that our McDonald’s and Burger King meals look nothing like the as-seen-on-TV advertisements. In Japan, you can eat the picturesque Big Mac you’ve always dreamed of, albeit alongside a non-supersized portion of french fries. Still, it’s more than fair to take a look past Trump’s apparent good behavior in Japan and ask him to improve as a diplomat. Just last year, Barack Obama made history as the first sitting president to visit the Hiroshima Memorial hoping to promote peace and engage in a joint effort to “pursue a world without nuclear weapons.” Many hibakusha, those exposed to radiation from atomic bombs dropped on Hiroshima and Nagasaki, fear that Trump does not fully understand the impact that another nuclear war could have on Japan. Instead of budgeting time to visit the Hiroshima Memorial, Trump preceded his trip to Japan with a trip to Honolulu. He engaged in necessary and vital security briefings at Pacific Command, but ended his visit with a tweet that reminded his followers to “Remember #PearlHarbor.” It was discourteous at best, and bad diplomacy at worst. We can forgive Trump a little fumbling in a notoriously etiquette-driven society very different from America. What’s harder to forgive are the non-gaffes — the deliberate choices, like skipping the Hiroshima Memorial, which make it clear just how little Trump cares about building a real working relationship with Japan. Sarah Kawaguchi is a culture writer based in the San Francisco Bay Area, United States and she is rooted from Tokyo Japan.